Delhi is all set for the 4th edition of Horn OK Please - Delhi's happiest food festival co-powered by Uber eats and MAGGI from the 16th -18th November 2018. 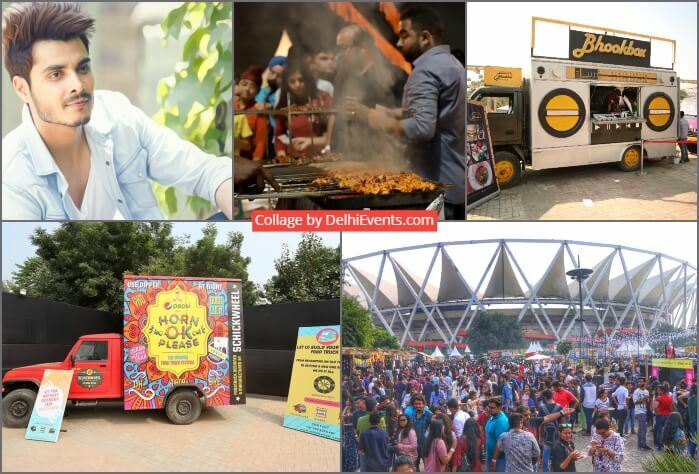 Horn OK Please is a family friendly food festival showcasing 150+ eateries from across the city, food carts and an expansive Food Truck Park, a Kebab Gully zone besides many more elements and new concepts like a mini carnival, adventure games and a Kids’ Zone. Experience Zone | The Experience Zone will consist of bull rides, a Rocket Ejection ride, trampoline, professionals performing thrilling BMX skateboarding stunts, a life-size Jenga installation and even an ATV track. The Grub Campus | Catering to the student populace in the city, The Grub Campus will offer dishes like Maggi, momos, burgers, pastas, funky French fries and lots more, all under Rs 200. The Kebab Lane | Horn OK Please will also have an entire area dedicated solely to sizzling and meaty kebabs boasting of 100+ varieties of kebabs. Quirk Bazaar | A mini flea market with a lot many boho brands offering everything from junk jewellery to hand-painted sneakers will be The Quirk Bazaar. Dessert Lane | The Dessert Zone will bring together the best home bakers and dessert places, each one with something different and special to offer - from black ice creams to bubble waffles and freakshakes. China Town | Yet another fabulous new addition to Delhi’s Happiest Food Fest is the China Town zone which shall be offering an array of Pan Asian delicacies. With so much more to offer this time around, Horn OK Please is well on its way to becoming the biggest and happiest food festival across India. I would like to share something about this so called Food Festival, Delhi Horn OK Please about which I was very excited.I went down there with one of my friend and was highly dissatisfied and disappointed with the Whole Fest excluding the Concert part.This could be explained more with some details that I would be discussing further but before that I would like to put something that was actually good. The decorations, the structure, the attractions for fun and adventure were truly worth for the fest and remarkable.They were quite colorful and truly providing the feeling of the fest, that someone has really entered into. Moreover, the concert was too energetic and exciting that made people musical and have more fun, dancy and creep ups all around.I truly liked that and can appreciate it.After this , I would like to point out the dislikes of the fest that I Felt. So, i would like to start with the entry fees which was expected to be 100 or 150 bucks on an average but did costed 299 bucks without any cover. Seriously, was this fest meant to make a loot from people but I did get an explanation from the sponsors that to have a better and a proficient crowd, this was the amount decided as entry fees.Agreed to their point, but with no cover was not at all expected. At least they should have covered 50% of the entry fees or a free meal or a fixed amount on discount on some specific shops.This made me disappointed from the organizers and their strategies which I would truly call was a bad money making strategy with a customer dissatisfaction. Secondly, I would highlight the main agenda of the event which was to see something innovative in food, a new era of food with a mesmerizing style and taste owing to all the best food joints being invited and gathered from Delhi, which was really the missing element in the whole fest.All foodies that are available outside and with the same prices, oh I should say lower prices were there.I didn't find anything new, nothing innovative and experimented with good.It was all either North Indian,Italian and blah blah.It just seemed as If all the Food joints have just put up their stalls for being popular, making money and increasing of course the TRP of their shops. Thirdly, I would like to put focus on the prices on the menu for each and every shop.Lets consider a number of 50 joints, out of which I have just seen 4 joints having one or max two items under 150.All the menu item prices were too raised as If they have put some extra effort in making those or something new has been done to them. For instance, 6 pieces of Momos on the same food joint is available at 150 outside, but in the Fest, it was 250. This would make a middle class person to think Is it really worth it to have 6 piece dim sums at 250?Guys, we really need to look into this. I think above all was my experience(have heard the same from many ) and will seriously like the organizers to think of something else as a money making strategy.They should pay more attention to what people might have expected and have you fulfilled that or not atleast.